Do you want to achieve the Robert Pattinson messy do? KMS California Clay Creme can do wonders. It is a creative clay creme that provides a strong pliable hold and incredible matte finish. Ideal for shaping and controlling layered looks and short styles. Suits all hair type as well. KMS Clay Creme gives the most amazing look. It’s texture, leaves a matte finish and has incredible hold. Apply this clay creme using your finger tips rather than your palms. It’s much easier to achieve vital styling precision. Hair care for men's can be difficult at times, This KMS Hair Product is particularly versatile, suiting most hair types. This creme may not suitable for thinning hair. 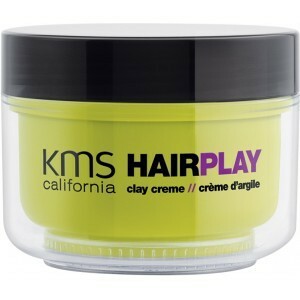 This KMS Hair Play smells and works great, just like it promises! If have short hair this might be the product that you can use when trying to put the final touches on your hair.